A Mouthful…of Words and Cookies! 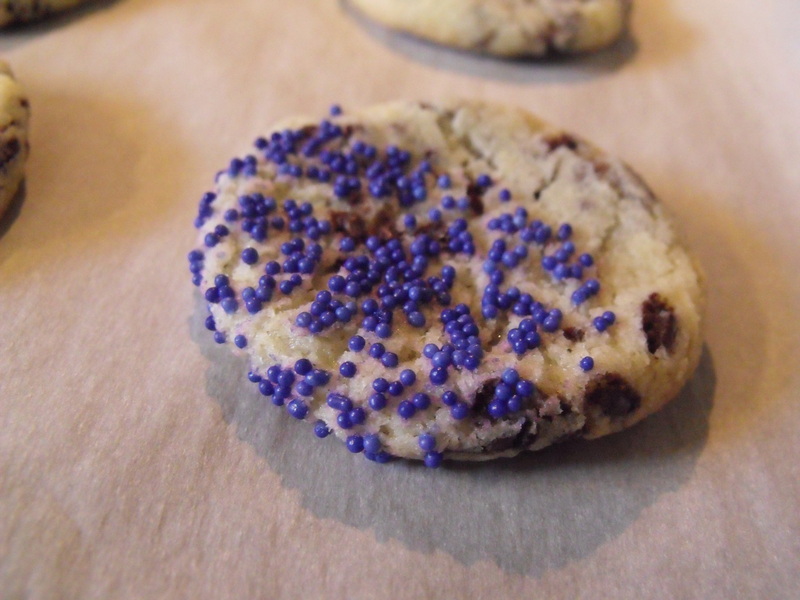 While trying to think of a name for this post, I started typing out what this cookies could be called. Oatmeal Pumpkin Chocolate Chip Cranberry Cookies. Woo! I’m almost out of breath after saying that one! And let’s face it, it’s hard to say… a ‘mouthful’, if I may. So, one day I saw these in my news feed and knew that they needed to be in oven baking, like right now! These are super easy to make and generally healthy as well. Only a 1/2 cup of sugar total. No butter. No oil. But don’t let the healthiness scare you off, they’re really yummy! In a small bowl, whisk together pumpkin, egg, and vanilla until well combined. 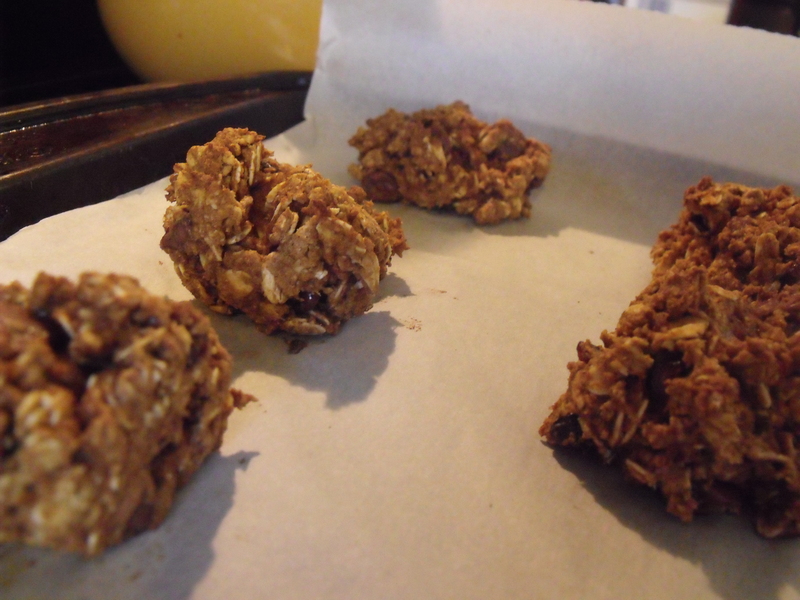 In another bowl, mix together, flour, oats, sugars, baking powder and soda, and spices. Fold together wet and dry ingredients until just combined. Place spoon-fulls of dough onto prepared cookies sheet. You know those really soft, frosted cookies that you find in bakeries at Walmart, Copp’s or any other local grocery store? You know what I’m talking about. They’re like 1/2 inch thick and usually have really thick frosting in a multitude of colors and sprinkles…we can’t forget the sprinkles! These are one of my favorite kind of bought cookies, at least as far as bought cookies go. These and Oreo’s..but that’s another story. Anyway, I got a hankerin’ for baking today and asked my Facebook fans if they had any suggestions. Now, lets face it. I don’t have thousands of followers, but I have a handful and they usually comment on my stuff. Well, today, I had one. One friend comment. All she suggested was that she wanted to make something for the Packer game coming up this Sunday. I instantly knew what I needed to make. 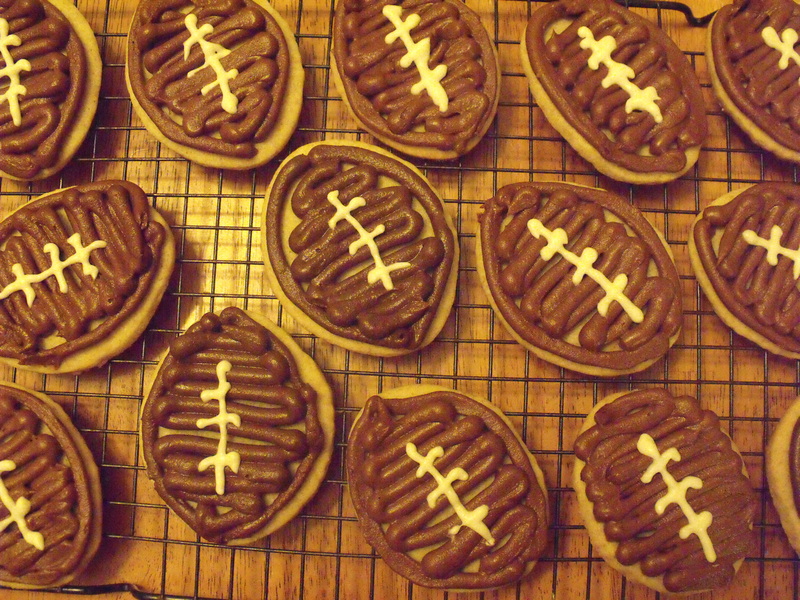 My new football cookie cutter came to mind and VOILA!!! I knew what recipe to use and everything! 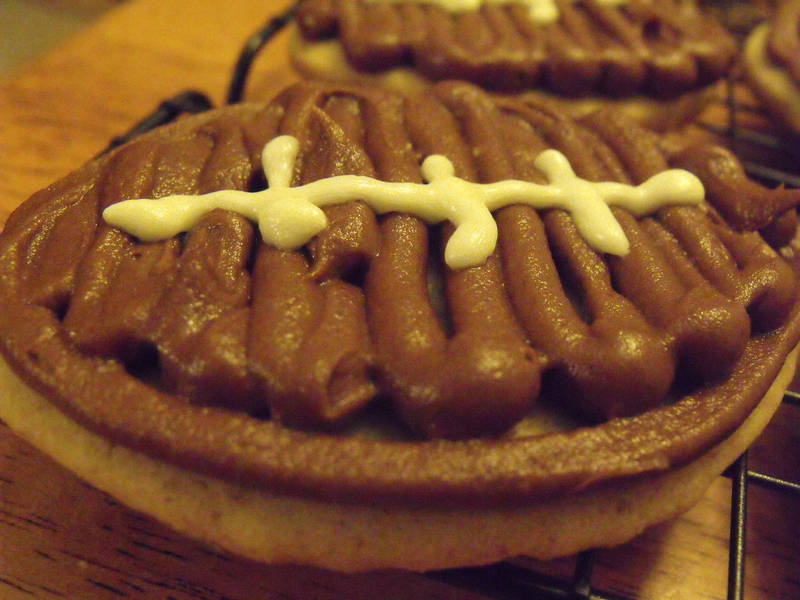 My adorable football cookie cutter! 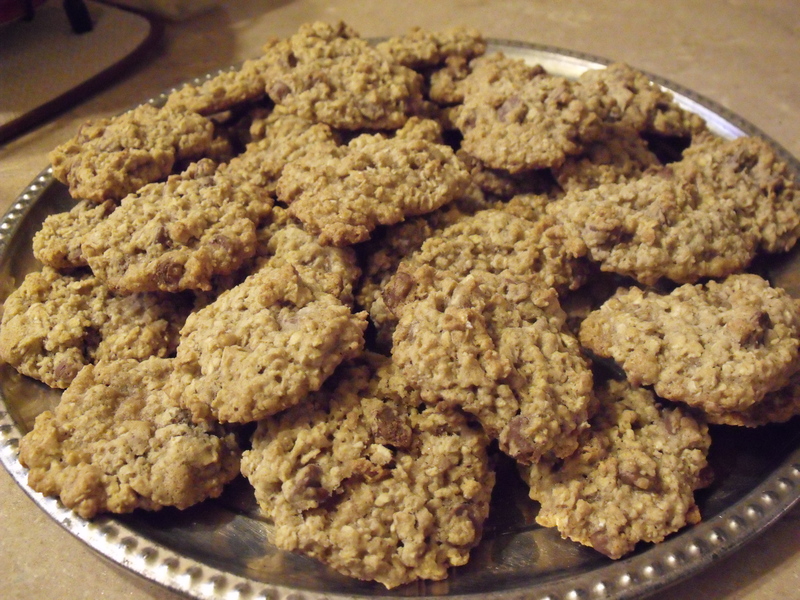 My sister gave this recipe to me a couple years ago and besides my raisin oatmeal cookies, this is probably my hubby’s favorite cookie that I make. They’re soft. Chewy. Fluffy. Delicious. I topped these with my Cinnamon Butter Cream . Do you have to? No. But I had it left over from my Pumpkin Patch Cake I made last weekend. So instead of freezing it and eventually throwing it away, I decided to use it. All I had to do was use a little brown food coloring. I really like Americolor coloring. It makes very vibrant colors and results in not being able to taste the coloring. Some brands, since you have to use so much to make brighter colors, start to taste like the coloring…not good. Not good at all. In a large bowl, cream together shortening and sugar until smooth. Into the creamed mixture, add the flours, baking powder, and salt. Mix until it forms a nice ball. Cover and place in the fridge for about and hour. 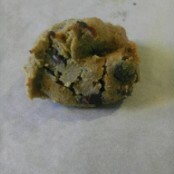 Roll out the cookie dough to no less than 1/4 inch thickness on a lightly floured surface. Bake 6-8 minutes. DO NOT LET THEM TURN BROWN. If you think they don’t look done at the 6-8 minutes, they are. Take them out. I only baked mine for 6 minutes and they were perfect. Let the cookies rest for a couple minutes before transferring them to a cooling rack. Note: you can totally use all-purpose flour for all of it instead of adding the whole wheat pastry flour. It will.work either way. Note II: Any type of frosting or cookie icing will work to frost these cookies. Use your favorite frosting or find a recipe on here! I’ll be the first to admit that. So when I saw this recipe for Low-Fat Chewy Chocolate Chip Cookies, I wasn’t going to let them fool me. How could cookies with only 2 tablespoons of butter be soft and chewy. No way. I went to work. First making these cookies. Boy was I wrong. These things were a hit! 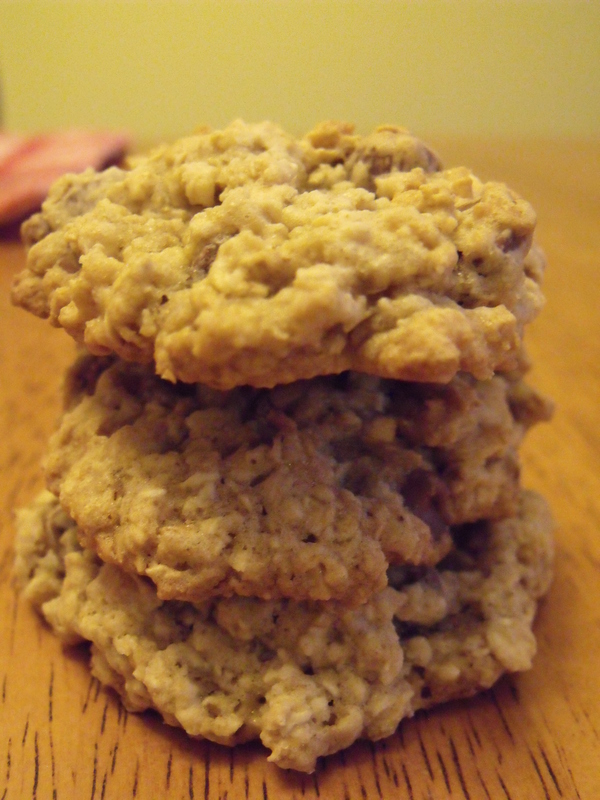 Even with only two tablespoons of butter, these were the softest most delicious chocolate chip oatmeal cookies I’ve ever made! They were still soft the next day even! Now that is impressive to me. These are also pretty versatile. You could add raisins instead. Or butterscotch chips. Anything your little heart desires, really. This was all of them…besides the ones I ate. You could easily freeze these cookies to bring out for a special occasion or freeze the dough. Don’t they just look so good? You will want to go make them now..trust me. In a bowl, combine butter, sugars, egg, applesauce, and vanilla; mix well. Add oatmeal, mix well. Fold in chocolate chips. 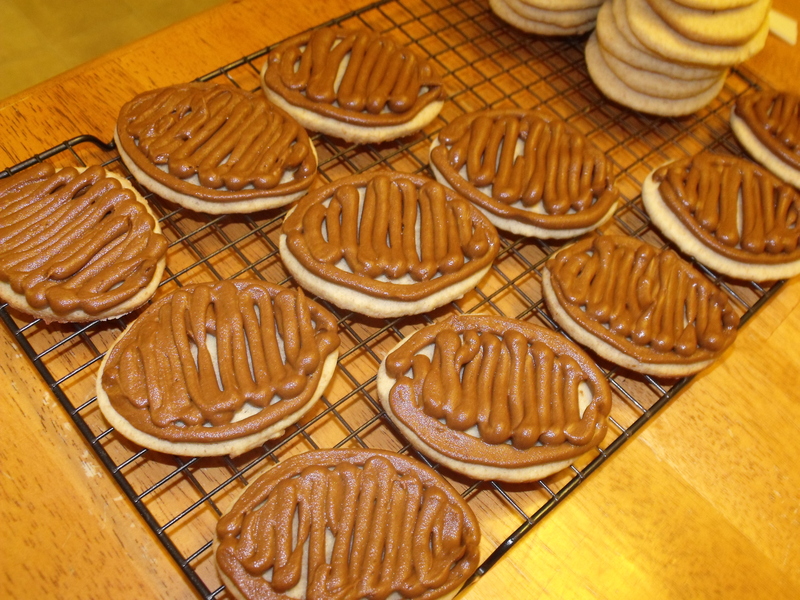 Drop by tablespoon-fulls onto lined cookies sheet. Bake for 10-12 minutes until the edges are just turning light brown. Let cool for a couple minutes before transferring to a wire rack to cool completely. Some wonderful friends of mine are moving this week/weekend. Actually, two family’s. One family bought a house and the other family is going to be renting the other families previous house. So all this is going down in one day, and sadly, it has to be a Friday, so I won’t be of much help with my two boys running around. Sorry, but I just can’t any of that going well. So I decided to offer to bake something! Since it’s obviously a passion of mine, why not? What I did not know, was that it would be 93 degrees outside when I had to bake. Praise the Lord for air conditioning! 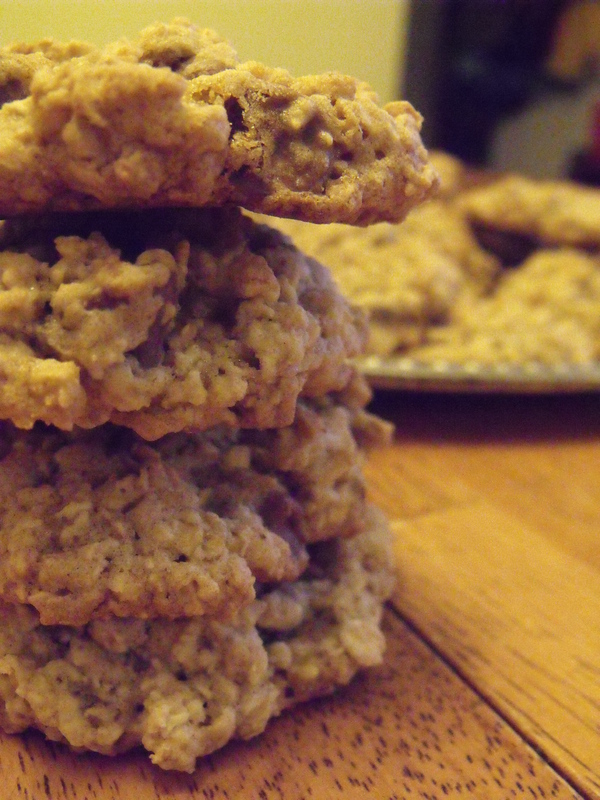 In my head, I knew I wanted to make two different kinds of cookies. One with chocolate (later decided it to be m&m’s since I was somehow out of chocolate chips..I know, I know…) and a sugar cookie of some sort. But since I don’t make sugar cookies that much (because of my addiction to chocolate) I went on a search for some delicious sugar cookies.When I make cookies, I don’t want flat, hard cookies. NO. I want puffy, soft, melt-in-your-mouth cookies. You know the kind. They’re they ones your Grandma used to make when you were a kid. The ones that went perfectly with that glass of milk (I wouldn’t know what that is like though, since I was lactose intolerant as a kid and now don’t like white milk..oh well). 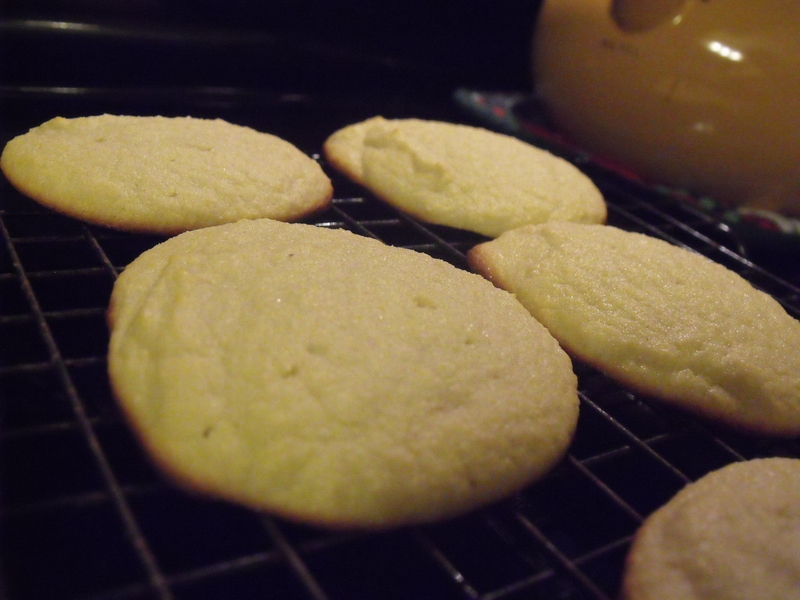 The sugar cookies used butter extract, which I’ve never owned, but am pretty sure I will need to pick some up at the store next time I’m there (thankfully, payday is soon! However, I managed to make them anyway. She had a note towards the end of the post about substituting the butter extract for almond extract. And since I decided to make a double batch, I used half almond and half vanilla extract. I’m also not a huge fan of almond extract, but these cookies actually taste pretty good! As for the m&m cookies, she said to refrigerate them for as long as you can…well, I don’t have that long… so I haven’t actually decided if I have time to make them or not…indecision at it’s best. Now, these cookies didn’t turn out puffy. But they are soft and delicious and that’s good enough for me! I also didn’t have all the colorful sprinkles that I saw in the cookie post, but I did my best and put colors together that are cute anyhow! 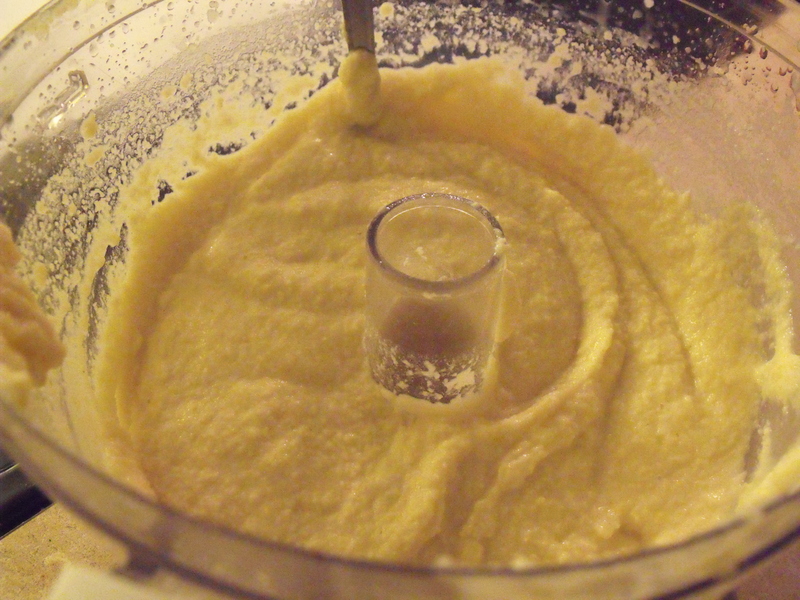 In the bowl of a stand mixer (you could probly do this by hand too) blend butter and sugar together until fluffy-ish. Add egg yolks, almond extract, vanilla extract, baking powder, and salt until well combined. 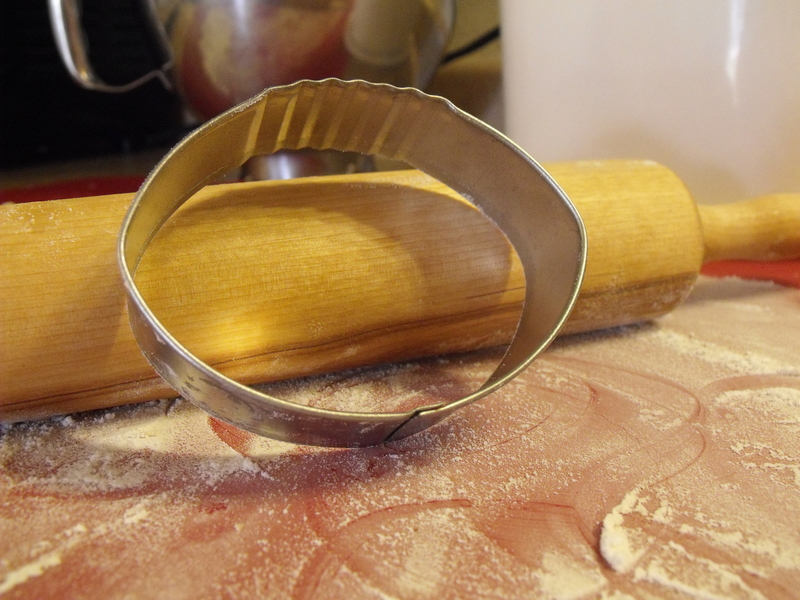 Mix in flour until the dough form a ball and pulls away from edges of bowl. Carefully mix in 1/2 cup sprinkles. 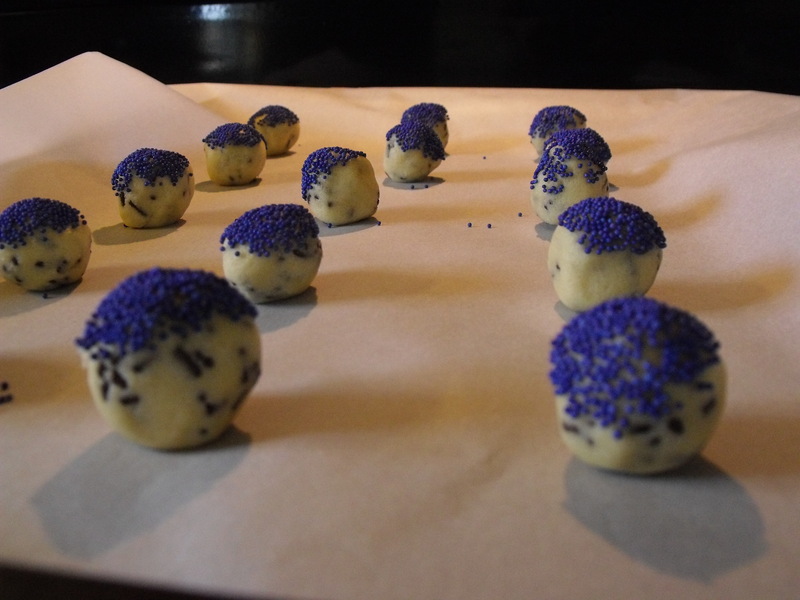 Roll cookie dough into teaspoon size balls and roll in remaining 1/4 cup sprinkles. Place on cookies sheet and bake 9 minutes or until just done. You don’t want to over bake these, then they will be hard. Let cool for a couple minutes pan before moving them to a cooling rack to cool completely. I know what you’re thinking. 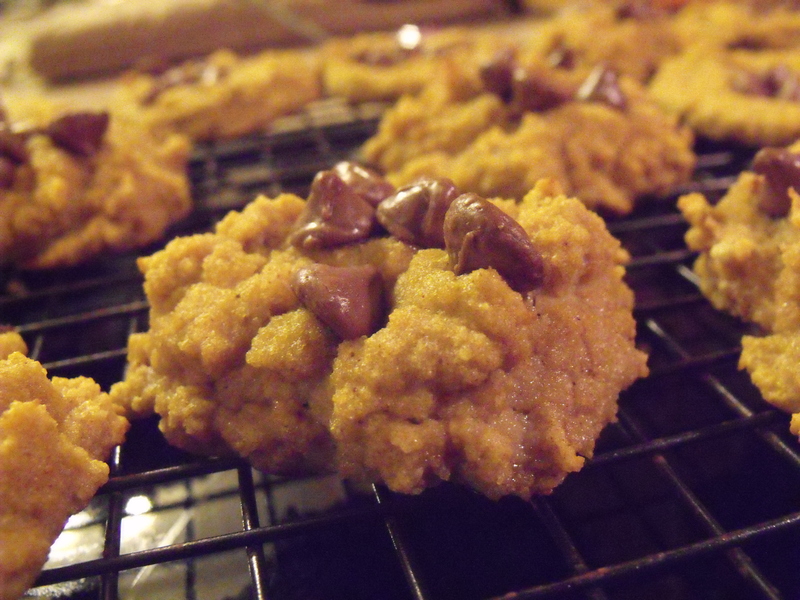 Chickpeas…in a cookie. That sounds gross. Well, let me tell you, it is ANYTHING but gross. It is amazing! If you are looking for a healthy alternative to your favorite cookie in the whole world, your search stops here. Now, don’t get me wrong. These don’t taste exactly the same the buttery, sugar-filled deliciousness of normal chocolate chip cookies. But, these are clean and gluten free, and packed with protein, thanks to the beans. It’s kind of like eating a ball of dough every time you eat one. They’re pretty great. Also, a big shout out to Janelle for letting me borrow her food processor! Thanks Friend!!!! Preheat oven to 350 degrees. In a food processor, combine all ingredients except the chocolate chips, until perfectly smooth. Either fold in the chocolate chips with a spatula, or throw them in and pulse a few times to incorporate them in all the dough. Line a baking sheet with parchment paper. 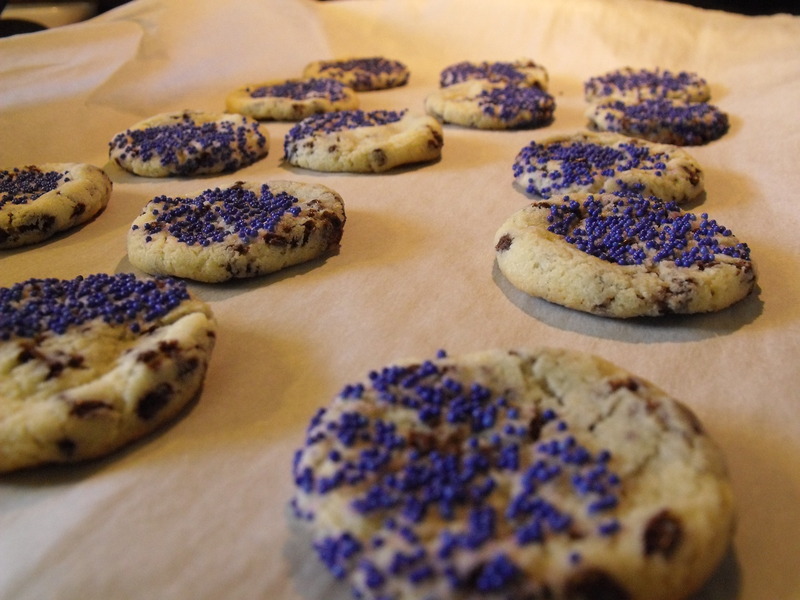 Place tablespoons of dough onto cookies sheet and bake for 10-15 minutes or until the cookies are golden in color.